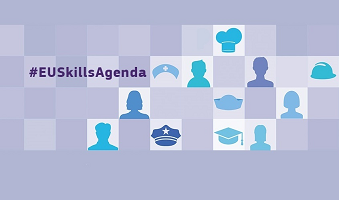 The European Skills Agenda was announced in the 2016 Commission Work Programme. Launched on 10 June, it aims to support upward social convergence and contribute to the European Commission's first political priority, "A New Boost for Jobs, Growth and Investment" by addressing three pressing challenges of today's economies: the lack of relevant skills to match labour market needs, the insufficient transparency of skills and qualifications, and the difficulty to anticipate and forecast skills. - the intention to ensure both curriculum and teaching methods focus on developing a broader range of skills needed for the jobs of the future and society at large. Indeed, recent studies show that 92% of employers are looking first for transversal skills, such as openness to and curiosity about new challenges, problem-solving and decision-making skills, confidence, tolerance towards other personal values and behaviours. The Entrepreneurial Skills Pass is helping us move in this direction. - the encouragement of education institutions to actively engage with business and other relevant actors. Today, the JA network brings thousands of businesses into partnership with schools with 165,000 employee volunteers teaming up with 120,000 teachers across 40 countries. - the support for vocational education as a way to reduce skills mismatches. The proportion of students going into STEM is not increasing at the European level and VET is still considered as a second choice. Targeted programmes such as Skills for the Future are helping change attitudes and outcomes. - the willingness to empower schools, teachers and educators. Time has come to put the spotlight on teacher training as well as the provision of good content, tools and methods. Newer areas like entrepreneurship and digital are in high demand. The ICEE research initiative and the EE-HUB are specially designed to bring more and better support to teachers and schools. JA Europe however regrets that entrepreneurship is not underlined in the New Skills Agenda as a life skill relevant to all individuals. JA Europe recommends consultation with all stakeholders in order to ensure effective implementation and monitoring of progress.